The explosion that ensued was one of the world’s greatest prior to the arrival of atomic bombs. It shattered the port of Halifax and surrounding area. The death toll was 1,600, while 9,000 others were injured, and 6,000 homes were destroyed. Two ships were approaching Halifax harbor on the morning of December 6, 1917, one arriving, loaded with ammunition, and the other on its way to Europe with a load of coal. Some confusion existed between the two ships, in spite of the fixed rule about how to pass, over whether to pass on starboard or port sides of the ships, which caused a collision in the narrow entrance to the harbor. The incoming ship, the Mont Blanc, had just come from New York and was about to add some coal to its cargo in Halifax before sailing for the war zone in Europe. The usual red warning flag that is always flown on a munitions ship was missing. The captain did not hoist it because he feared it would make his ship a special target for lurking German submarines. The ships collided and set off a gigantic explosion. Within minutes the whole surrounding area was shattered. There were other reasons for some carelessness on the part of the outgoing skipper. His ship, the Imo, had been delayed and he was anxious to leave with his load of coal for Belgium. Traffic was heavy in the narrow channel because this was December and in a northern country like Canada there were only a small number of daylight hours available. Ships and tugs alike always wanted to get out of the channel before dark. Captain Le Medec of the Mont Blanc signaled a port passage to the Imo as the ships approached each other. The Imo captain replied, suggesting a starboard passage, then sailed on without waiting for a reply. One of the sacred rules of navigation is that you do not act, in a case like this, before the other side agrees. A few minutes later the Imo’sprow cut into the Mont Blanc ahead of the main hold where all the TNT was stored. Captain Le Medec tried to swing his ship around in a desperate effort to avoid the collision. He knew what could happen if his ship were to be hit but in the narrow channel it was impossible to get away from the other ship. A drum of solvent was broken open in the collision and a spark ignited it. As the liquid ran down into the hold the fire spread to the huge quantities of TNT. The Imo captain backed his ship away and beached it. Years later a man who lived close to the harbor reflected on the event of December 6, 1917. He lived to tell the tale and he remembered wondering at the time why two ships could come so close to each other without trying to avoid a collision. He noticed that the Mont Blanc tried to swing away but it was too late. One moment after the collision it was clear that the munitions ship was about to explode. Halifax harbor is only half a mile wide so the amount of space available for altering course was minimal. The tide carried the Mont Blanc toward a pier on the south side where a telegraph operator was on duty. He watched the ship come closer and closer and he knew about its lethal cargo. Instead of running away he stayed at his post, sending out warning signals, and just before the explosion he shouted a goodbye. His body was found later in the evening. The power of the explosion swept away churches, factories, and every other kind of building. Nothing was left standing. Fires broke out all over the place and shells and other ammunition rained down on people with some of it exploding in the process. Terror-stricken men and women and children, all of them covered with black soot and bleeding from numerous cuts from flying pieces of glass, were the common sight everywhere. When the Mont Blanc exploded it just vanished in a cloud of smoke— blast of air and debris rose a mile high. Devastation was everywhere within a one-mile radius. Some bodies were thrown half-a-mile on to the shore. A thirty-foot tsunami erupted and, carrying rocks scooped up from the seabed, destroyed all the piers together with their contents. The tragedy was all the worse because of the war. Large numbers of military personnel and supplies were assembled at the harbor, awaiting transportation to Europe. Two further complications made circumstances especially difficult for victims. The worst blizzard in living memory had just hit Halifax and temperatures were well below freezing. Many victims who were trapped in buildings froze to death. The second crisis was a forced evacuation because of the danger of fire at the munitions’ stores. Out of a total population of 50,000, about 1,600 lost their lives, a further 9,000 were injured, and 6,000 lost their homes. It was the most violent human-made explosion prior to the appearance of atomic weapons. The blast shattered windows one hundred miles away. Damage amounted to $35 million, an enormous sum at that time. Subsequent investigations concluded that the captains of both ships were to blame for what had happened but only minor penalties were given. The city of Halifax had to be completely rebuilt. Halifax was not the only place in North America where accidents involving munitions occurred both during World War I and in the years immediately afterward. 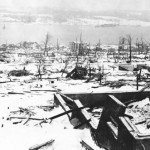 On May 18, 1918, in a suburb of Pittsburgh, an explosion shattered the neighborhood around the factory of the Aetna Chemical Company, a manufacturer of TNT. The accident was triggered by an error in the part of the factory where various chemical components of TNT were being mixed. Workers nearby heard a low popping sound, something that would normally be ignored, but those familiar with the manufacturing process reacted immediately. They knew that in a matter of seconds the whole building would explode. A few managed to escape but most died. By the end of the day 241 were dead or missing and four hundred others were injured. The first building to explode was the one in which chemicals were being assembled. As the building went up in flames it set off the next building in the complex and so the fires and explosions continued like a series of gigantic firecrackers until, within a few minutes, the whole neighborhood was wrecked. Heavy machinery, walls, roofs, and rafters were shot into the air, to descend minutes later on those trying to escape the inferno. Ambulances were dispatched to the scene from every hospital in the Pittsburgh area while company guards and local police set up a barrier to protect people from the burning factory. A morgue was set up near the factory and a train arrived to supplement the work of the ambulances by bringing the injured to hospitals. This train could only come to a point four miles from the accident scene because tracks had been covered with debris so the injured had to be carried to the train. All telephone and telegraph lines had been severed so there were no means of communication with places beyond the factory area, resulting in delays in getting help for the injured. Eight years after the TNT explosions at the Aetna Chemical Company, on July 10, 1926, a lightning strike hit the depot at Lake Denmark, New Jersey, where the entire U.S. Navy’s store of munitions was kept. Everything was blown sky-high in one gigantic explosion. It all happened during a thunderstorm in the late afternoon of July 10. A lightning bolt struck one of the storage units where TNT was kept and started a fire. It could have been contained but the officer in charge had been assured that the protective system in place would prevent damage from any lightning strike. The result was that the little fire mushroomed quickly into a catastrophe. The lightning-arresting system which had been installed for just such an event, for some reason failed. Lake Denmark’s Naval Ammunition Depot was located about thirty miles west of the Hudson River in New Jersey. The navy’s entire supply of munitions was stored here and ships came up the Hudson River for supplies. They were then transferred by rail from the depot to the ships. In those years the fleet was concentrated on the Atlantic Coast so this location was accessible at all times. The army also had a munitions supply depot alongside the navy’s depot. In all there was a complex of 180 buildings, including some manufacturing. Because of the huge quantities of explosives kept at this center and because of the frequency of summer thunderstorms in this part of New Jersey, a lightning-arresting system had been installed. On July 10, 1926, near a storage unit that housed a million pounds of high-intensity TNT, a lightning bolt struck. That should not have been a problem as the lightning rod had been installed within a few feet of that location. For reasons that were never clear, something failed to work because within a few minutes a small fire appeared and almost at once a fire alarm rang out across the whole complex. One officer half a mile away from the fire looked out of his office window in time to see a huge white flash. He ducked down under the window and lay on the floor, knowing that the blast from the explosion would momentarily smash into his building and demolish it. A few seconds later that was what happened. One after another high-explosive rounds exploded and fires sprang up. The entire area within half a mile of the arsenal including all the buildings was destroyed with all surface objects swept away into the distance. Of the 180 buildings that comprised the arsenal only sixteen survived. For about ten hours, fires and explosions continued unabated and none of the fires went out during that time. Not until the following morning were the flames finally doused. Residents as far as fifty miles away heard and to some extent felt the blasts. When it was all over damage added up to more than $150 million. Thirty lives had been lost and two hundred others injured. The countryside was all torn up around the arsenal, leaving it like an old-style battlefield. Deep craters were torn out of the sandy soil. Steel girders were thrown a mile from the blast site. A large piece of a charred wooden beam was found on a farm three-and-a-half miles from the blast site. New Jersey’s governor together with its two senators requested that the whole arsenal be moved from the state. Both the general public and the media supported the governor. The War Department was so moved by the event that it thought it had been the world’s worst explosion. It certainly was the worst explosion in U.S. history up to that time. The navy was rightly blamed for not taking adequate safety precautions. The lightning-arresting system clearly was inadequate and the high concentration of explosive material in so small a space was, to say the least, unwise. There was severe criticism of the navy from the U.S. government, both for the cost of the tragedy and for the dangerous position in which it placed the navy. Two years after the explosion the Department of Defense Explosives Safety Board was established. It was instructed to provide oversight on all aspects of explosives, including maintenance, transportation, and storage. Never again would so high a concentration of munitions be found in one place. Arsenals were subsequently placed in low population density areas across the country.